Summer-flowering clematis are some of the first plants to start growing. A hard prune to a bud at knee-height will ensure that the plants do not form a bird’s nest of growth at the top. Make sure that you train in the new shoots, with pea sticks or a brush, as they can easily sprawl if not given support. Most plants that are pruned hard for flower or foliage appreciate a spring feed. A handful of slow-release blood, fish and bone spread over their root zone, and a mulch of compost, will set them up for the summer. It is also time to winter-prune wisteria. If you are doing things by the book you will have already taken last summer’s growth back to six buds in August. Cut back again now to shorten the summer prune and anything that might have got away afterwards to two buds. Never cut into old wood if you are renovating a wisteria that has got away, because it will not heal, but anything under the thickness of a candle is fair game. Hard-prune buddleia back to a low framework, reducing all of last year’s growth to a couple of buds. Shrubs grown specifically for their foliage, such as Sambucus ‘Black Lace’, can be pruned in the same way. Where you have bulbs coming up in the borders, start to tidy last year’s perennials to avoid trampling them underfoot. Where you can, leave good skeletons until the end of the month for the wildlife and for the added protection they give new shoots. Cut back last year’s autumn-fruiting raspberry canes to the ground as they fruit on this year’s wood. 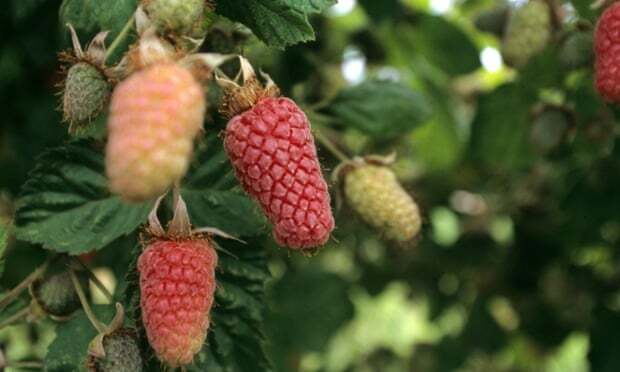 If you haven’t done so already, cut out last year’s canes on summer-fruiting raspberries and on climbing berries, such as loganberry and tayberry, as they fruit on last year’s wood. Take old growth right to the ground and tie in new canes, then mulch. Topdress blueberries with an acidic compost or pine needles if you don’t have acid ground or are growing them in pots. After meeting them in Japan, I have started growing honeyberry (Lonicera caerulea) in my alkaline soil as an alternative. The dark blue fruits are more delicate in flavour than blueberries, but just as delicious. Snowdrops are wonderful for breaking winter’s hold. Splits I made from an original clump four years ago will be dividable next year. It is debatable whether moving Galanthus in-the-green is better than planting them in the autumn as bulbs. I lift them just as the flowers fade, and water-in in the divisions, so that the roots don’t dry out in cold winds. You are less likely to feel the chill yourself with such delightful distractions.